Others have a full on conversation during their set. Obviously, they are not exerting themselves if they can talk during lifting. Needless to say, they are not getting the results they want. I’m not saying you can’t socialize while there, but give the exercise your full attention. So, if you have spent the money to join a gym, and making the effort to actually turn up, make it count! If you’re lifting, aim for 8-12 reps per set and adjust the weight so that after the last rep you couldn’t do even one more. Alternatively, you can slow down the descent of a lower weight (eccentric part) and control the number of reps this way. The most important aspect of a workout is intensity. If you’re on a bike or treadmill, then put some effort in as well. Again, if you can talk, then speed it up a bit. What works even better, is interval training where you sprint for a short period, and then jog for a while to recover your breath. The aim here is to get puffed out during the sprint phase, so no talking! And if you’ve done it correctly, then talking during recovery phase will be difficult. How long should the sprint phase be? Again it depends on the intensity. I’ve done 15 second sprints on an elliptical machine and managed to get my heart rate to over 200 bpm, but 30 second sprints would be ok, too (with less intensity, of course). So, put on some metal (or any other high energy music) on your headphones and hit the gym with all you’ve got! You’ll get through your workout faster and have more time for other things. Also, headphones on your ears will discourage others from making empty conversations and wasting your time. A controversy about it has been raging even since fluoride’s been being added to the drinking water. And toothpaste, and other dental products. For generations we have been told how good this poison is for our teeth. Well, not everyone agrees with this narrative. And now we have the authorities (CDC) slowly backing out of what they were saying for such a long time. This article basically says that less toothpaste is better because of the contained fluoride. What is this article if not an admission that fluoride is a poison? If your aim is fitness and health, any toxic material in the body will prevent it or slow it down. The body will be wasting precious resources on trying to eliminate it, rather than building muscle or fight any possible infections. Warning – this may upset some people! The story of Cain and Abel, as told in Genesis book of the Bible, tells us that Cain killed Abel out of jealousy due to Lord rejecting his offering of fruits of the land while accepting Abel’s offering of meat. So the Lord punished him by banishment. The point I’m trying to make, is that if God preferred meat over plant matter, shouldn’t we also eat meat? After all, God made us in his image. If we take this story from the Bible literally, then we can conclude that animal diet is preferred to a vegetable based one. Obviously, we have a few bits and pieces missing here, as the story further continues to say that Cain wandered to the land of Nod where he built a city and fathered a line of descendants. Whom with? – is the first question. After all, he was the first child of Adam and Eve and Abel was the second. Were there other humans around? Obviously he didn’t build a city by himself unless he and his sister (must have been the one that followed him) multiplied like rabbits and lived extremely long. You need a lot of manpower to build a city… There could be other details missing in this story prior to, or during, the incident. Was there an argument? One that maybe lead to a fight? A provocation? “Do not be like Cain, who belonged to the evil one and murdered his brother. And why did he murder him? Because his own actions were evil and his brother’s were righteous.” So, this can also be interpreted that children of Satan eat plants while children of God eat meat. This is something that blew mind! I have always been under the impression that herbivores, like cows, would derive their energy from carbohydrates. After all, grass is a carb, right? Well, it’s mostly cellulose and is indigestible by humans. Maybe good as fiber. While I was aware that their digestive systems are different from carnivores’ ones, I thought that due to different enzymes/microbes they can break down the fiber into simple carbs. How wrong was I! It turns out that the microbes in cows’ digestive systems actually ferment the grass and turn it into fat. This fat provides up to 70% of cow’s energy needs. This is one serious high-fat diet! I am not sure if even carnivores can compare… Of course, if humans feed the cows with grain, then it’s a game-changer. 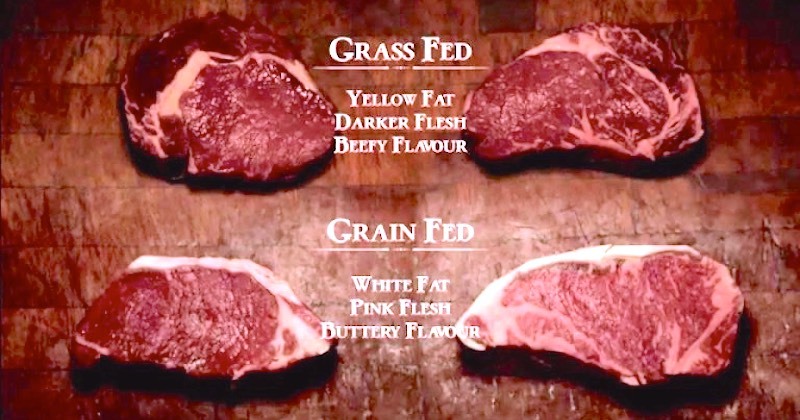 You can actually see the difference in the meat and there is a market for grain-fed beef, e.g. Wagyu Steak. I’ve now hit 12 months into this experiment of living without carbs. Well, almost without carbs as it is very hard to cut them out completely. I still allow myself some minimal amounts once or twice a week. For example, a glass of wine with lunch on Thursdays since it’s a company lunch and I might have some rice on other occasions. Nevertheless, the amounts are minimal when compared with everything else over the whole week. One other point I have to make here – I eat fruit but not many vegetables. This is purely from convenience point as fruit is much easier to eat due to minimal preparation required. Some would argue that fruit contains fructose and it still is a carbohydrate. Technically yes, however, you need GLUT transporters to absorb fructose. Their release is triggered by insulin (all 18 of them except GLUT-4, which is insulin independent as far as I know). I believe that in my case I would not produce much of them so I would not be absorbing much fructose. Therefore, in my mind, it is of no consequence. Besides, fructose is safe for diabetics as it does not raise insulin much due to its low GI value. Otherwise, my diet mainly consists, in no particular order, of: meat, fish, eggs, butter, cream, coconut oil, cheese, kefir, some sauerkraut and mushrooms. Also, sometimes I have no-carbs noodles made out of root of konjac plant as a pretend pasta. These noodles, and fruit would make up the most of my fibre intake. So, how does it feel to live on protein and fat? To be honest, after an initial period of adjustment, there is no marked difference. Any advantages are very subtle and gradual. My weight has dropped by a couple of kilograms since my last update and then recovered, but that could be explained by reduced food intake. I no longer can be bothered, nor feel the need, to eat 5 times a day. Now, I have just increased my intake of fat – mainly butter cause I like the taste. Some noticed effects are: less bloating after a meal, no feelings of hunger even after long periods without food, and no ups and downs in energy levels. Unfortunately, I do not experience any more energy than before, it’s just more stable – there never is a need for a coffee and a donut after lunch, although I was still craving them for a while. Cravings for any food item are mostly gone, and that includes alcohol. I bought a 6-pack of beer about 2 months ago, and still have 5 left in the fridge. A couple of years ago I would buy 6 to 12 beers per week. Also, this year’s flu season seems to have bypassed me altogether with not even a cold, whereas same time last year I was sick a couple of times. Now for drawbacks. One obvious one is not eating some foods that I enjoyed in the past. Namely bread, pasta, pastries and cakes. I am not mentioning other carbs like rice or potatoes since they are not as enjoyable as the former ones… Another one is change in frequency of bowel movements due to no carbs and lower intake of fibre. This has however come back to normal although took a while to do so. One other thing to mention is extra intake of salt. Apparently, insulin’s other function is to make the body retain sodium (and water). Therefore if my body is not producing much insulin due to no carbs in the diet, I take extra salt dissolved in my drinking water. Maybe that’s why my keto flu was very mild – almost not noticeable. To summarize all this, I have been functioning perfectly well on ketones instead of glucose but unfortunately without any miraculous benefits or super-powers. At least not yet. When I say ketones, I mean that I have tested myself for ketones in urine over a period of few weeks just to be sure. I understand that urine test is not as accurate as a blood test, but the tests consistently showed low to moderate amounts of excreted ketones. Given that elevated levels of blood glucose are associated with development of insulin resistance and diabetes, I think that the less glucose the better. Is there a safe level though? I can find a lot of medical advice equating normal level with safe level but is it really true? If a substance causes damage in large quantities, is it be safe to assume that the same substance would be causing no damage in lower quantities? Or, just less damage… Logic dictates the latter is true but all the medical advice I find says otherwise. Could someone with more knowledge on the subject explain this to me? Again, there seems to be all-out media attack on a diet that people lived on before the advent of farming. Farming is generally accepted to be about 10,000 years old. Humanity, on the other hand, at least 300,000 depending on your sources. So, if the keto diet is so dangerous and shortens your lifespan, it must be a bloody miracle that we even survived for 290,000 years to invent farming. All the keto bashing just goes against all logic. Apparently, keto diet is only useful for epileptics where conventional medication does not work. Hmmm… Are these patients less healthy otherwise? Are they dying prematurely? Do they lack energy and have to dragged out of beds? Are they obese? I hear crickets… Furthermore, how did the prehistoric people have all the energy to run and hunt? I have now been living on a keto diet for almost a year and I can say that I am not going back. They can have all the bread, pasta, rice, potatoes, etc. I am very happy without these foods. I am 50 yo and never felt better. Have more energy now than 20 years ago – 1.5 hours in the gym 5 times a week without running out of energy. I even managed to put on some muscle. I drink coffee now because I like the taste, not because I need a pick-me-up. My desire to drink alcohol has totally disappeared. When I went skiing, I could go all day without eating lunch and did not feel any weaker. Well, maybe I am different from the rest of population… Maybe I’ve got some alien genes, or something… OK, don’t take my word for it. Just look at Halle Berry. There is a reason that she looks half her age. So now keto diet is a fad diet promoted by celebrities and not worth even wasting your time thinking about… Perhaps we no longer see Halle Berry in any movies because she looks too good and we can’t have people asking too many questions or, god forbid, imitating her?